READY ON THE RIGHT ? READY ON THE LEFT ? All is not ready on the firing line. The firing line being the bridge at Regency Heritage Park. and looking down range, to the southeast on the right (the side the school is on), is a MS4 channel “Municipal Separate Stormwater Sewer Systems” or storm drain or System designed or used to collect or convey stormwater (including storm drains, pipes, ditches, etc.) 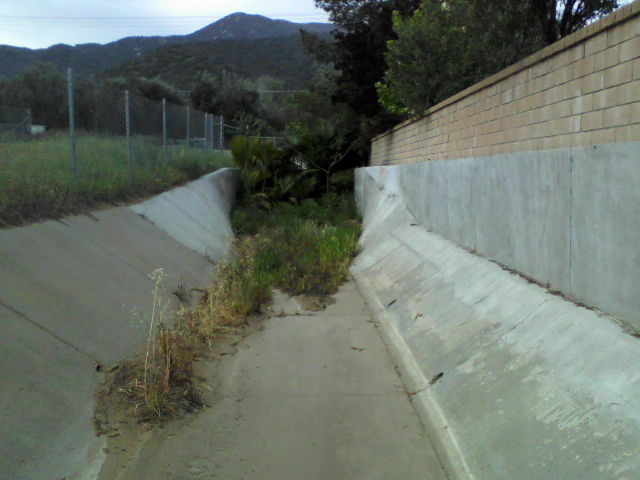 leading to Grand Avenue which collects stormwater from the mountains to the south of the park. Another look towards Grand Ave. Heading towards Grand Ave and Sheila Ln. While standing in the same spot if one looks to the left (up the hill towards the houses) is a flood channel coming off of Palomar Street. 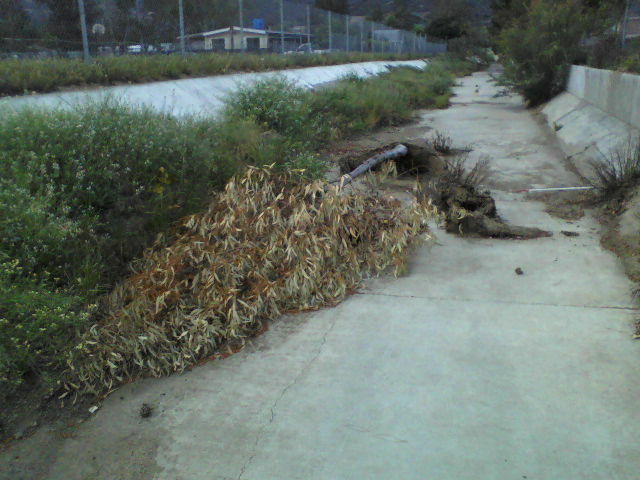 Another look towards Palomar St. 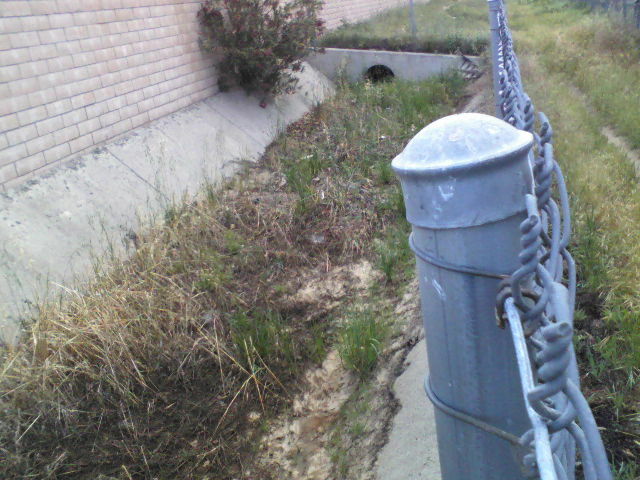 The channels are on property owned by Riverside County EDA and listed as part of the City of Wildomar’s drainage system on the Santa Margarita River Watershed MS4 Facilities Map. 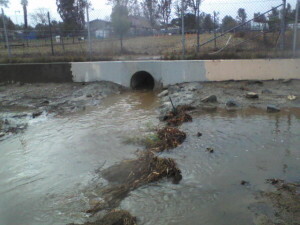 Which is owned and maintained by Riverside County Flood Control and Water Conservation District RCFC&WCD which collects run-off from as far south and east as Mission Trail, Bryant St. and the pit called Marna O’Brien Park. After only 3/4 of an inch of rain had fallen overnight. Sedco Bryant St. Drainage from hills west of Grand Ave. after 3/4 of an inch of rain. 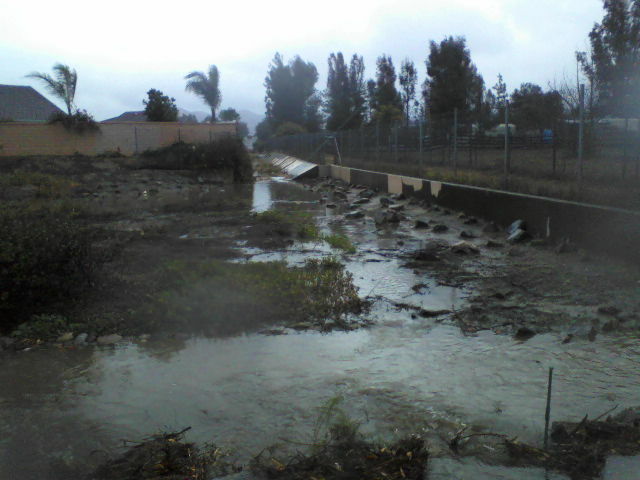 Unnamed channel from Palomar after 3/4 of an inch of rain. After many man hours countless thousands of dollars and months later it still looks like this on Opening Day. 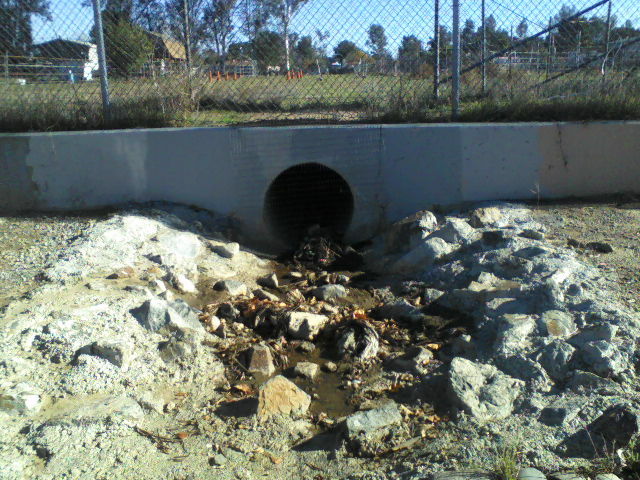 This entry was posted in Future City of Wildomar, Parks, Shenaigans, Water and Drainage Issues and tagged Dog Park, Drainage, Flood Control, Regency Heritage, Wildomar on April 14, 2014 by Kenny. Thankfully there will be no measurable rain until maybe some monsoon activity in late July/early August. That gives plenty of time to the city to make sure that area is properly cleaned out, which extends well north of the dog park boundary. 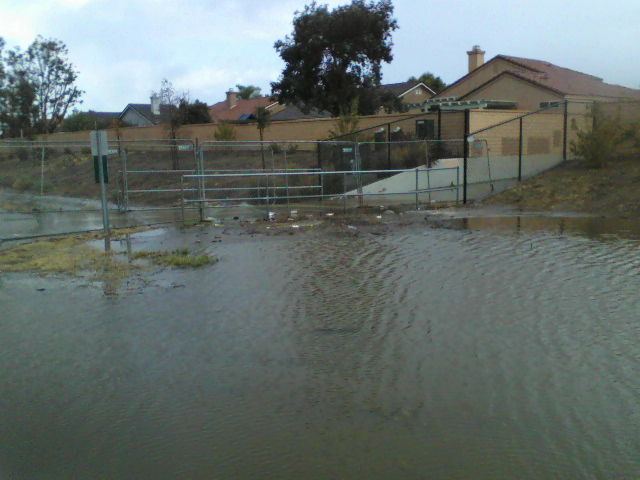 I was talking to someone that knows the area well, and could hear the concern about the drainage, and what a big rain would do to the newly refurbished park. Though I fully support the idea of using the area as a park, it can only be done if properly maintained, with twice yearly cleanings (if not more). 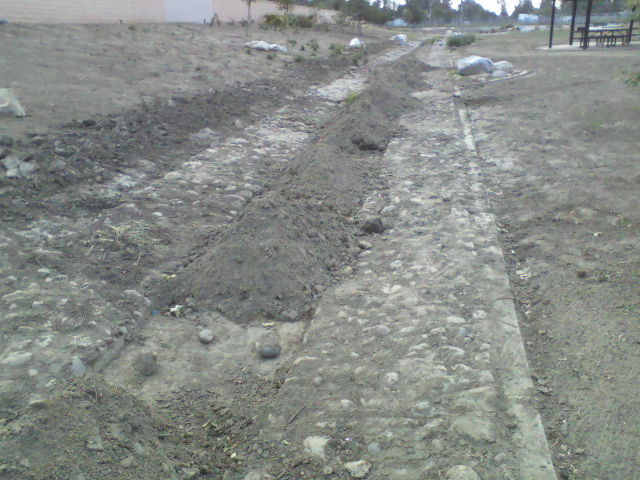 One before the rainy season starts, and one once it’s over. If that isn’t scheduled then, like daylight savings time is, then it’s only a matter of time before that area gets laid to waste. Joseph – Thankfully or hopefully ? The picture of the bridge troll housing was taken on opening day. I had already mentioned the water going over the bridge to the city manager and city engineer back in late February because of this condition, but to no avail apparently. 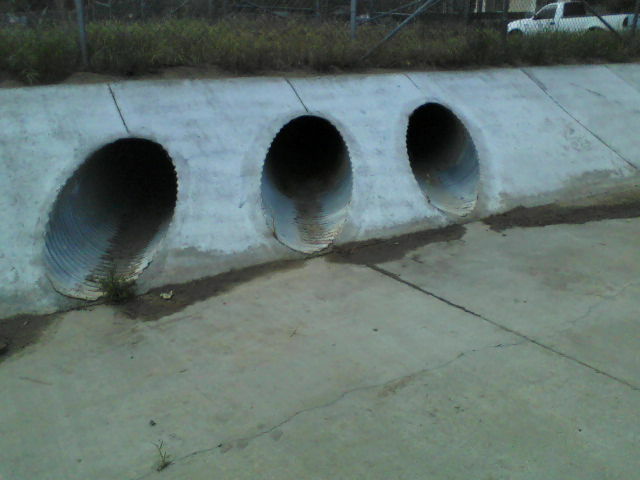 As to the drainage channels there appears to be a blame game going on as to who is responsible for cleaning them out, the city needs to take the bull by the horn and do it then figure out who is responsible. 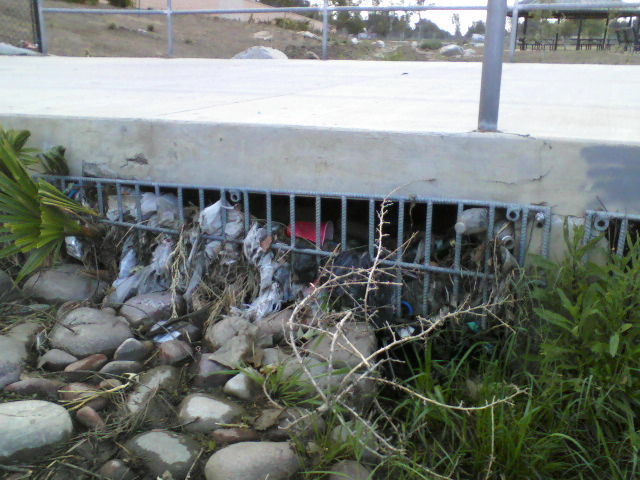 The problem with leaving it is it will end up in the park and park maintenance and operations money should not be spent cleaning up storm drain issues. The issues do extend north of the park boundaries all the way to Corydon but get complicated by access to easement issues which I haven’t been able to determine who owns them, RCFC&WCD or EDA or ?. 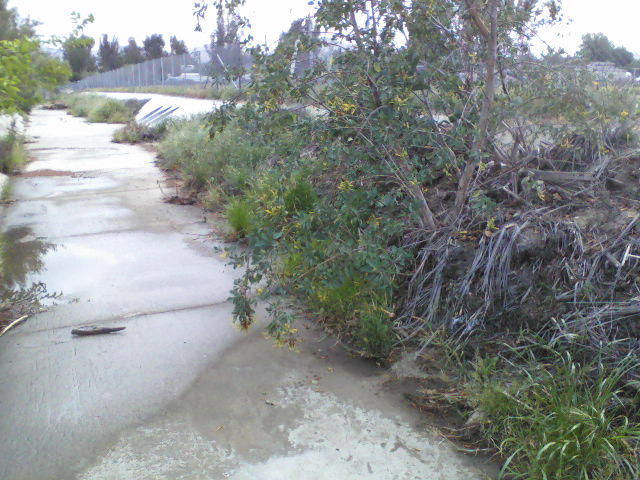 There are other issues in play as well with the native riparian growth that has developed in that portion of the channel. I would like to see a volunteer effort but forth to remove by hand some of the dead fall in the channel which would go a long way towards opening up the flow of water without destroying the habitat. This is something the Parks Commission could work on if we ever get one. AH, the legacy of Alain Grenier. OK ? Not sure which Alain Grenier you are referring to, the hockey player, the real estate agent or the French Diplomat. The former director of the former Ortega Trails Recreation Dept that chose the locations for our parks. 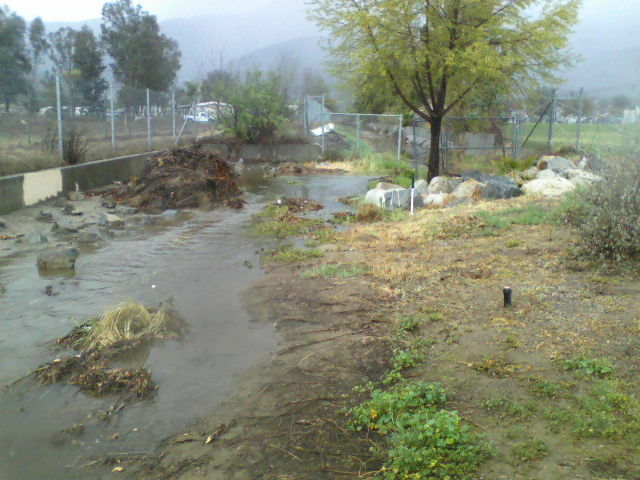 The real winners were the “Pit” off Bundy Canyon, a funnel shaped lot that would fill up with runoff and Perret Park on the shore of Lake Elsinore. These were lawsuits waiting to happen. Cubby – thank you for the reminder. Having attended a number of parks meetings back in the day I did not remember this name. 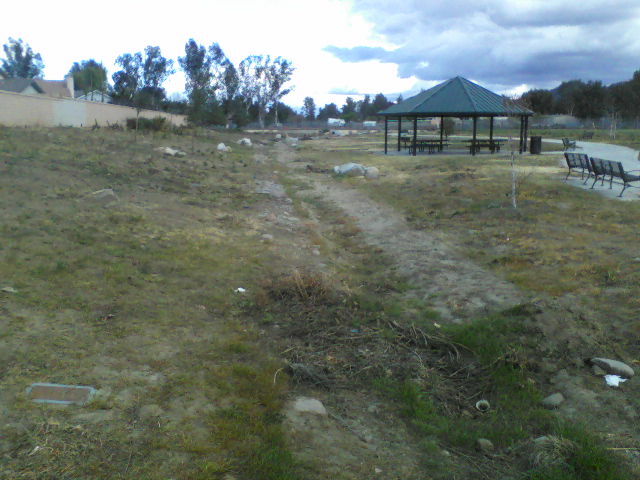 The one thing that clouds my memory of those days was when Ortega Trails wanted to build a strip mall at Wesley/Palomar as a way to fund a community center, that and the exorbitant price they paid for the turkey ranch and rehabbing the old farm house were enough to fog the mind. As to the Pit off Bundy are you referring to the retention basin on Gafford Road or the parcel up by the water tank out by the Farm. 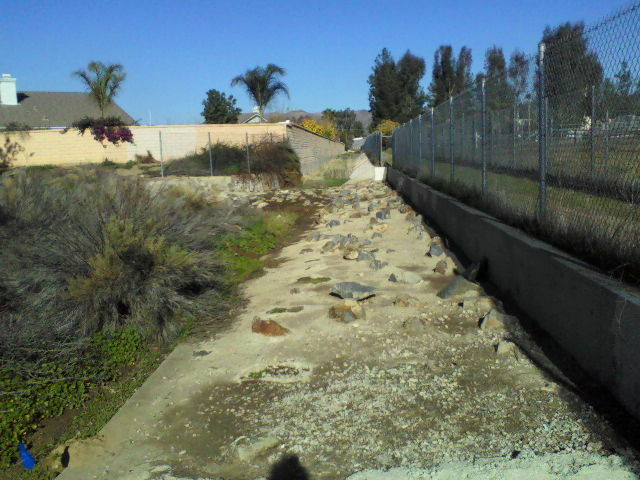 The retention basin is actually a nice set up and should be used once again, after all the community paid for the inner fence around the walking path at the top, the walkway to the bottom and the slab in the bottom, all it takes is to redo the agreement with flood control, basically pay for liability insurance along with having someone open and close the gate. It is one place the County Flood people actually maintains as the slab is still quite usable and the trail along the top is in good shape. Perret park in Lakeland Village was turned into a nice park, not by Ortega, a little pricey but nice.